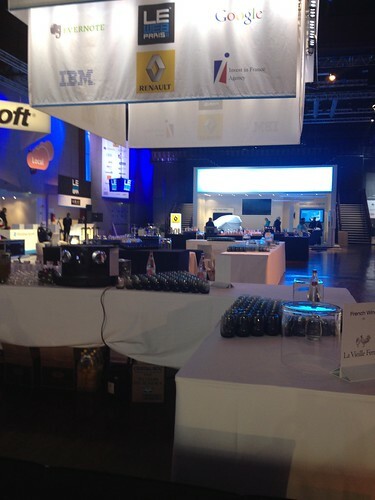 I arrived slightly too early at LeWeb this morning, before they were really ready. People were running around still setting up, on stage, rehearsals were taking place, running through demos and videos, some of the ‘top secret’ that we were asked not to mention as they are big reveals for later in the day. I’m predicting coffee problems though, there’s 4 small Nespresso machines in the main area, serving up expresso. I guess it tastes good (I never do expresso unless forced to) but I’d prefer big coffee! And service will be slow. But that’s the only niggle so far, wifi is fast, I have a seat and a table for blogging (although I’m going to have to continue to get here early for that, as only 60 seats set up), food is good and I’m expecting the usual mixture of big speeches and interesting interludes. As well as one of the best places to connect with the best tech and web people in Europe.